think went really well with this stamp. ranging from cute to artsy. This was one of my artsy day purchases. Vibrance Brown, VersaMark Ink, and clear embossing powder. Hi Beverly, I entered the same ABC challenge. I just had to stop in and see yours. I glad I did, it is great. Wow! Speechless...can you ever do autumn! Gorgeous - love the colours! 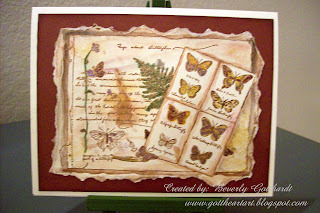 Fabulous card and gorgeous butterflies. Thank you for joining in this week's ABC challenge. Wow, Beverly! Love this! the soft neutral colors are perfect here! Feels so vintage and homey! Terrific job!